We had a very eventful beginning to our year, to be sure! About 8 months ago, I had planned to take my children to Florida to visit with my best friend from my childhood, as well as to give them an opportunity to ride an airplane. My daughter rode once when she was about 18 months old, but, other than that, they were clueless to the experience. So, I cashed in some frequent flyer miles and decided to take them on a little trip. Over the course of time since we made the airline reservations, we learned more about Winter the Dolphin and decided we would go meet her when we were there. 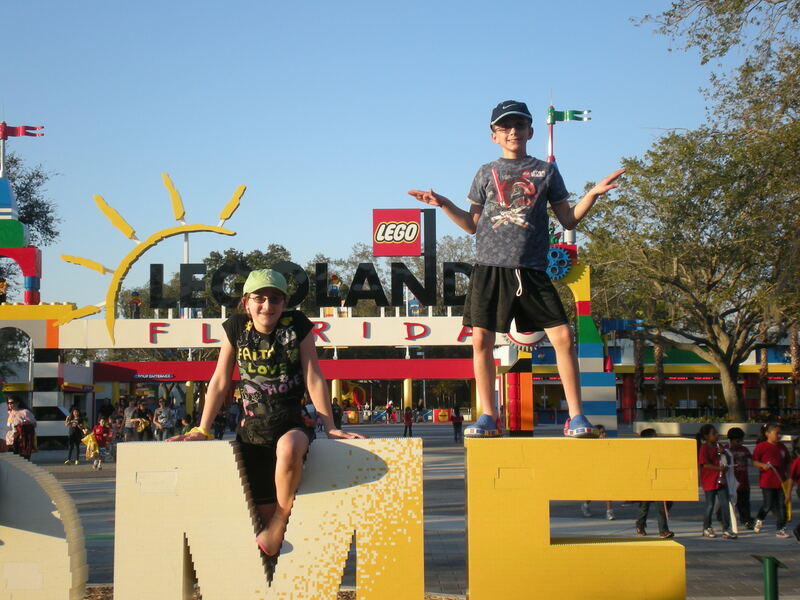 Also, a new LEGO land theme park opened up just an hour or so from our destination, so this made my resident LEGO maniac (my son) VERY excited. However, as the trip approached, my son came down with a very sudden, extreme illness that landed him in the hospital on IV fluids. We were supposed to leave on Thursday at 6am, and it was Monday and we were in the ER. Oh boy. The kicker is that he had slipped and hit his head when we were at a swimming pool the day before he started his constant vomiting, so we were concerned that his illness was due to the head injury. Regardless, he could not stop, nor would he intake any fluids, so off we went to the ER. Then the ER turned to an overnight “upstairs”. The Doctors did not feel he had a virus, because his white counts were low, but by the second day, they no longer felt it was from the head injury. He seemed fine, so he came home. They attributed it to something he ate that “didn’t agree with him”. The next day we left for our hotel room near Detroit, where we would spend the night before rising at 3am for our early flight. In the car on the way down, he was sick AGAIN. Our hopes for our trip were hanging in the balance, but my husband reminded me (on a frantic, tear-filled phone call home), that our son often gets carsick when he starts a drive with an empty stomach (which we had), so it was probably unrelated. Big sigh and we were back on the road to the hotel. THANKFULLY, he was fine for the flight, but when we arrived in Tampa, we headed straight for the Clearwater Marine Aquarium (CMA). Long story short, we were once again halted in the parking lot at the aquarium (for an hour) as my son’s stomach put him through the ringer yet again. After force feeding him gatorade and crackers, he decided he was fine and we finally got to meet Winter!! We were so relieved. The Clearwater Marine Aquarium was a beautiful, simple place, that exuded the heart and soul of its mission – to rehabilitate injured marine animals. I felt the tears filling my eyes as we sat and watched Winter paint on a canvas and jump in the water (without her prosthetic tail). I felt very inspired by the movie about her (“A Dolphin Tale” – See Earlier Post). However, seeing her in real life was extraordinary. The trainer said, though, that Winter had Scoliosis. In the movie, they did not use this term, but I knew what it was anyway. It was nice to have that name associated with Winter for my children, as they looked on in delight. They had a special bond with Winter that not many children had. 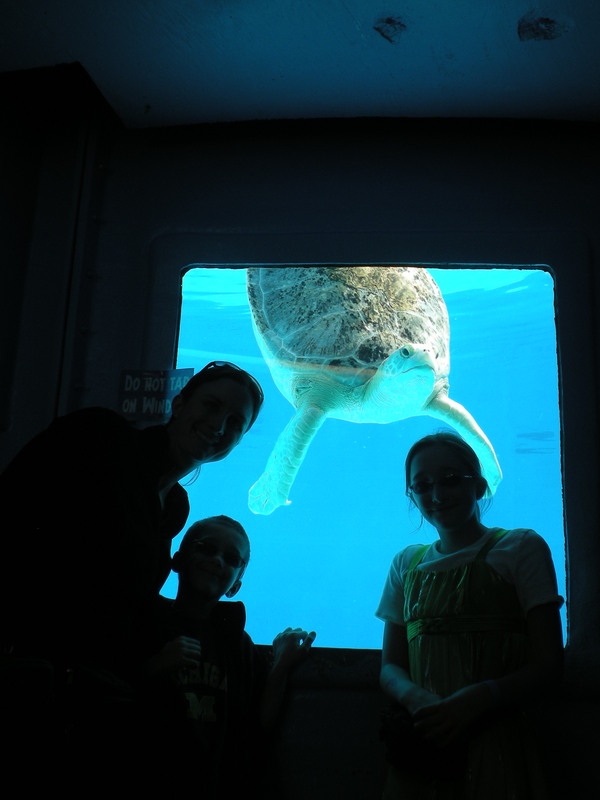 There were many other wonderful animals there – another dolphin named Panama (also featured in the movie), cow-nosed stingrays that the children could touch, and a cute sea turtle that had a paralyzed lower body (see our photo below). It was a magical place, and I highly recommend a visit! After our time at the CMA, we were still unsure of my son’s stomach, but he finally turned to me and said that he was hungry (the first time in days) and that he wanted Olive Garden. We were all very hungry and I figured that if he was craving food – any food – I would try to get him there, so off we went to the Olive Garden. After stuffing several breadsticks and some pasta into his mouth, he promptly leaned over in the booth and fell dead asleep next to me. But, from then on he was fine. Day 2 took us to LEGO land. This was another magical place. The park is geared toward kids ages 2-12 and it was perfectly suited for that. The rides were fun, the lines were short, the weather was great. It was a wonderful day. And, my son got to be healthy for the theme park of his DREAMS. He eats, drinks, and breathes LEGO! So, it was great fun for everyone. His stomach even did just fine on the roller coasters! WHEW! The third day, my best friend and her husband took us out on their fishing boat. 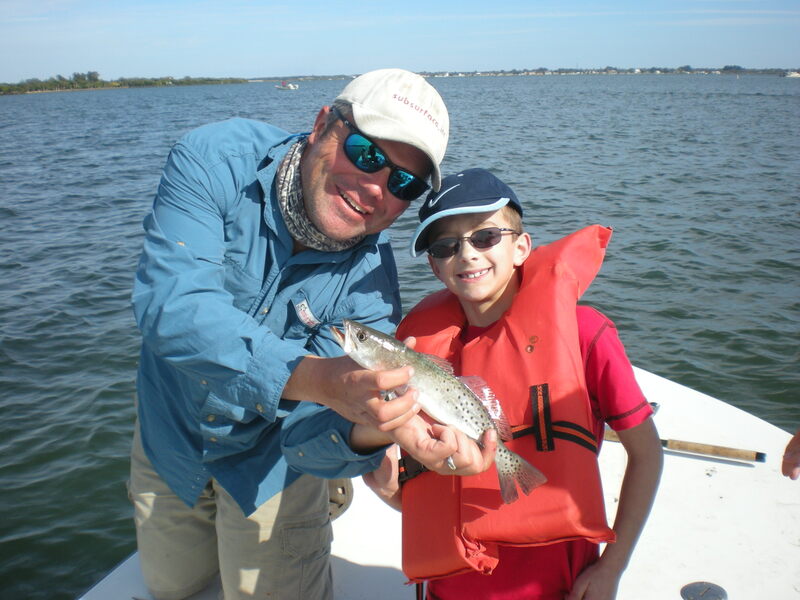 We had fun zooming across the bay and the kids learned to cast and reel fishing lines from an expert angler (my best friend’s husband). Both he and my best friend are marine biologists, so my daughter was in heaven, asking about every animal we saw out on the boat – and she was not disappointed, as all of her questions were promptly answered. The last day took us to the beach. The funniest thing that happened there was during lunch. We were enjoying a nice picnic and my son was holding his full-sized PB&J sandwich in one hand. All of a sudden, a swarm of seagulls dive-bombed us. I thought it was strange that they flew so close. When I looked back up, I noticed my son – sitting with a now-empty hand – the seagulls were in front of him, devouring the sandwich they stole RIGHT OUT OF HIS HAND! He even had a beak-mark to prove the assault (although miniscule). He didn’t know whether to laugh or cry – but, decided to join the rest of us who were laughing in earnest. Needless to say, he was much more careful with his Chips Ahoy! Those seagulls were not getting close to those! He chased them down the beach first, just to make sure. 🙂 After we finished our afternoon at the beach, we headed back to the house to pack and get ready to leave. We had a lovely dinner on the pier and caught a 9:45 pm flight. By the time I made the 2 1/2 hour drive home from the airport it was 3:30 in the morning and I was exhausted! It was a great trip and a rare opportunity to have time with my best friend – we’ve been close ever since the 4th grade, even though we have not lived in the same city since the 5th grade – most of our years, we’ve lived across the country from each other! But, with some friendships that doesn’t matter – you know each other so well that you just pick up where you left off last time and enjoy every minute. Speaking of enjoying every minute, we have a month-long house guest from Florida – my “baby” brother Jesse (who will be 23 in a week). He is off for a few months and decided to pay us a long-awaited visit before he heads off to Navy bootcamp. We are so excited to have this precious time with him. I am very close to him, as I spent many hours every day with him since the day he was born – taking care of him whenever I could. I feel like a second Mom to him and we’ve bonded even more over the years since our Mother died (when he was 7). So, if I’m not on my blog this month, you will know why – every minute counts and, while some responsibilities must carry on regardless of the circumstance, some can be postponed. So, I will see you in March! Have a wonderful month.